Anyone know of any app notes, tech notes, or articles that discuss this? But if both resistors have the same temperature coefficient and same temperature then the result of the equation will be always the same because both resistors will change by the same percentage, the only thing changing will be the current through the resistors. P.S. on a second thought there is the range of +/-100ppm/degree that may change the values of the resistors for non equal percentages but I wonder how different can two resistors from the same batch be. "For every effect there is a root cause. Find and address the root cause rather than try to fix the effect, as there is no end to the latter." ... but I wonder how different can two resistors from the same batch be. Alex, thanks for the reply. You are assuming that the two resistors are identical. One might be 10K and the other 1K. Both are the same type of resistor, but not from the same batch. I would expect them to track, but I've never seen this discussed anywhere. You'd think there would be some documentation on this. Thanks Brian, that's what I was looking for. FWIW... I've always understood that components of the same type and value will exhibit near identical temperature coefficients but that components of the same type but different values may have different characteristics. This feels right because the temp co is a function of the basic physics of the materials used in the device construction, with the actual values determined by the size and shape of each element. If we take, as an example, an old-fashioned carbon rod resistor then we have a number of 'series' elements which each have their own temp co e.g. the wire for the legs, the solder joint/cold weld where the wire meets the end cap, the junction of the end cap to the body, the body etc. etc. Identical value devices of the same type will almost certainly have near identical dimensions and hence a near identical temp co. Different values will have different dimensions and hence different a temp co. This assumption though is just that and is based on my understanding/experience of basic physics. Although I *think* that somewhere I once saw a graph which plotted temp co against value for a resistor. Given my work history that'll probably have been for a Philips MR25 series resistor which I think are now Vishay MRS25s. How much would the output vary with temperature if each resistor was spec'd at +/- 100ppm/degree? Even if R1 and R2 are identical, may be that one bunch or resistors will be finished just after soldering of R1, and R2 will be from another bunch, not so identical. So calculate that R1 is of +100 ppm and R2 is of -100 ppm, or vice versa. It is nice to talk about batches and all that, but you have to rely on the specifications. That is the only thing you can trust. If the specs say +/- 100ppm, then you can only assume that there is a finite chance that one will be +100ppm and the other will be -100ppm. No they won't track, because as said before, regardless of value of resistance, the temperature tolerance (coefficient) is +/- 100ppm, the other resistance could fall and the other could rise, when you raise temperature from the nominal (nominal is 20C for parts I know). Besides, the error in result would depend which way your 10k and 1k resistors are, do you divide to 1:11 or to 10:11. Assuming a temperature change of 10 degrees, other resistor +100ppm, other -100ppm, the result is either within 0.2% or 0.02%, because the absolute resistance range of 10k resistor is of course larger than absolute resistance range of 1k resistor. Use a spreadsheet program to solve this, Excel/Libreoffice/whatever. "but I wonder how different can two resistors from the same batch be"
For 1% resistors: As much as 2% since one could be 1% on the low side ( i.e. 99% of nominal) and the other could be 1% on the high side ( 101% of nominal). For 5% resistors: As much as 10% for the same reasons as in the 1% case above. That's at Room Temperature. Vary the temperature of the resistor and that will vary from unit to unit within the manufacturer's specified temperature coefficient bounds. In the previous posts this is stated as +/- 100 ppm, which is pretty typical for common 1% resistors. "Minus" means the resistance will drop as the temperature increases, "Plus" means the resistance will rise as the temperature increases. The manufacturer makes no claim (in my experience) that the nominal resistance of a given unit is related to the tempco of that same unit. So that, you can have nominally high units (101% units) with either Minus or Plus tempcos. Likewise for the nominally low units. The temperature in question is NOT the ambient operating temperature of your circuitry, but the temperature of the resistor(s) itself. So self-heating (I-squared-R) of the resistor must be taken into account if a detailed analysis is required. That's for the individual resistors that make up (e.g.) a voltage divider. To analyse the overall effect of these nominal tolerances and tempcos, you have to plug those values into the formula for the voltage divider. This can get pretty complicated if you do this with traditional algebra, a spreadsheet makes the numeric analysis much easie and user-friendly. 1. Two nominally identical resistors (each say, exactly 10.000000000 K Ohms), but with completely opposite tempcos - one has a minus 100 ppm & the other a plus 100 ppm. The result will be a perfect 2:1 divider at room temperatue, but that voltage division ratio will vary significantly as the operating temperature is increased or decreased. 2. Nominally different resistors, one is 9900 Ohms, the other is 10,100 Ohms. But their tempcos are virtually identical - say, Plus 100ppm. The nominal division ratio will not be 2:1 but 2.02:1 at Room Temperature. However, as the operating temperature is increased or decreased this division ratio will remain more stable than in the temperature-varying circumstances of Case A above. You get the picture? You can figure out the other cases. 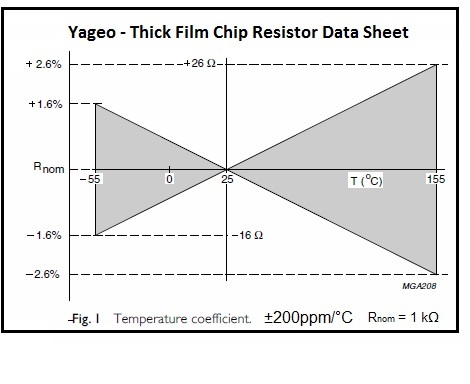 The fact that at temperature T, one resistor can have a positive temperature coefficient and another a negative coefficient with both resistors the same type and nominal value is supported by the graph from Yageo for Thick Film Chip Resistors (image attached). I don't understand why the same material would have such different behavior from sample to sample. I can't find a similar graph for Metal Film resistors. With 1% resistors, the maximum deviation is 1%. With 5% resistors, the maximum deviation is 5%. LT5400 - Quad Matched Resistor Network (DN502). Chauncey, Alex was referring to the temperature coefficients of the two resistors, which is what this topic/thread is about. You brought up the tolerances. And even if you were really talking about a "5% temperature coefficient at room temperature" (where did that idea come from ?) your math would still be wrong for the same reason. When/where did I bring up the tolerance? And temperature coefficients are usually spec'd in ppm/Â°C not %. On rereading your previous post, I see that you were quoting Chuck-Rowst, not alexan_e. I didn't mean to criticize you. It's just that the topic of this thread is the temperature variance of the voltage divider and some of the comments are getting off track. I got confused and thought you were the other Chuck in this thread. Sorry about that. Till now I thought that metals have always a positive resistivity coefficient. It seems to be true for pure metals. But their coeff. is too high. For example copper has cca 4000 ppm. Surprisingly I learned that some metal alloys can have negative coefficient. E.g. manganin with +- 15 ppm (see table in the link). Probably resistors are made from similar alloys. And coeff. depends on ratio of ingredients. I doubt the two resistors from the same factory serie can differ too much. One trick I picked up is that the resistors in a resistor network may have a tolerance of 1% but the matching between the resistors in the network could be .01%. I used this to design a differential amp for the input to an ADC. It provided a rather high Common-Mode-Rejection-Ratio (CMRR), a primary characteristic of a diff amp. You could put some of the resistors in series and some in parallel to get a 2:1, 3:1, 4:1, etc divider ratio. You would need to check a specific resistor network to se if it had similar specifications. 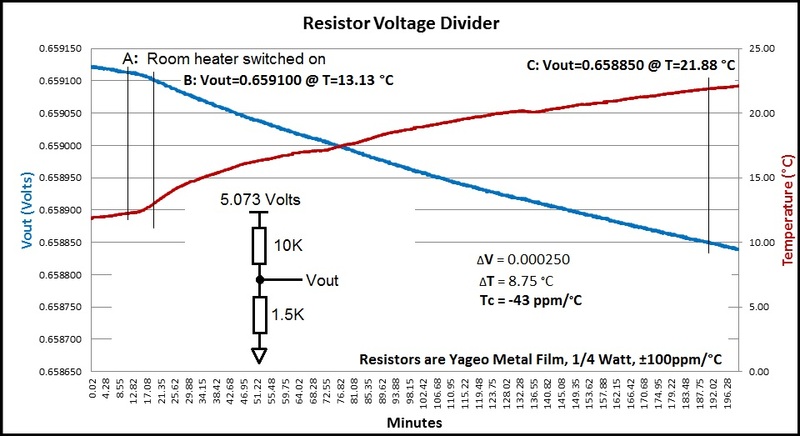 Please explain the Yageo graph that I posted earlier, which indicates that two resistors of the same type and nominal value can have opposite temperature coefficients - one positive and one negative. One trick I picked up is that the resistors in a resistor network may have a tolerance of 1% but the matching between the resistors in the network could be .01%. That's a neat trick, but doesn't pertain to the temperature coefficients of the resistors. My application for the resistor voltage divider is in front of an ADC, used to scale the input. Rarely has a convenient ratio of 1/2, 1/3, 1/4, etc. But it isn't, except if you use two resistors of same value, but not if you use two resistors of different values. For example a 1k 1% resistor has a -/+ 10 ohm range from nominal, and a 2k 1% resistor has a -/+ 20 ohm range from the nominal, so if you divide to one third (0.33333333) with 1k and 2k resistors, you will have a range of 0.3289036545 and 0.3377926421, meaning over +/- 1.3% tolerance in the voltage ratio by using only +/- 1% resistors. The source of the tolerance is irrelevant, it is just the same for temperature as I posted before. The coefficient does not depend on the value(Ohm) but only on material of the metal film. As I have writen, some alloys can have coeff. range from negative to positive values. I imagine that the factory does not succeed to mix the precisely same alloy each time. Then the coeff can have the different sign at two resistors. That is the case in the post I was responding to. That's not the post and not the poster I was responding to. I responded to a later post made by somebody else - a post that contained erroneous claims, and that sort of thing should be addressed. FWIW, I took a couple of resistors, wired them up as a voltage divider, attached them to a metal temperature sensor probe, and collected some data (shown in the attached graph). Of course one sample is not conclusive, but the worst result is no better than that shown and the best result is no worse. if you see at you have only 250uV drift on your measure. how sure at it is your resistor? if 100ppm is not good for your application, you can use 25ppm farnell has some resistor not expensive. But your concern must be more the tolerance than temperature. both resistance has same ppm/c and if they have same watts it is same variation and will be not matter. in your measure I will see more problem with copper wire than resistor. Note that we can talk about a batch of resistors, but that during manufacturing there is a point where more batches will be mixed up. so a 1% resistor with +100ppm/C and a delta of 100C also gives 1% change so you end up with 2% variation on your resistor over temperature. I am sure the drift is from the resistor divider. Both the power supply and DMM are very stable. I have used 10ppm/c resistors in previous projects where the requirements called for it, and will most likely do so again. I was running this little test to see if that was really necessary - it is. As mentioned in a previous post, the error due to the resistors' tolerances is zeroed out during calibration. It is the error from temperature variation that I'm trying to address in this thread. I had hoped to find more info in the literature. While the test I did was just a kludge and quite limited, it tells me that I still need to use the more expensive low ppm resistors for scaling the input to the high resolution ADCs. Your test is very interesting. I will never think it was a problem with ppm/c for a resistor bridge. I was sure at it is compensated because all resistor has the same coef. But I have some questions if you are seeing only the resistor temperature coefficient here. Have you ruled out moisture changes in flux remnants that cause change in leakage currents? What about the fact that connection between copper, solder, and resistor is actually a thermocouple, causing temperature based offsets? I would say at least those affect the actual readout because of temperature change, not just resistor temperature coefficient. How temperature sensitive is the ADC anyway? As mentioned, the test was just a kludge but I have reasonable confidence in the measurements. The resistors are THT types that were wired together side by side. The leads were insulated with heat-shrink tubing, and the two resistors were attached to the temperature probe with more heat-shrink tubing. With the distances involved and the insulation and low source impedance (about 1300 ohms), I don't think moisture is a problem. As for any thermocouple effect, that would apply to pcb mounted resistors as well, and in the past I haven't observed such errors when using low ppm resistors.